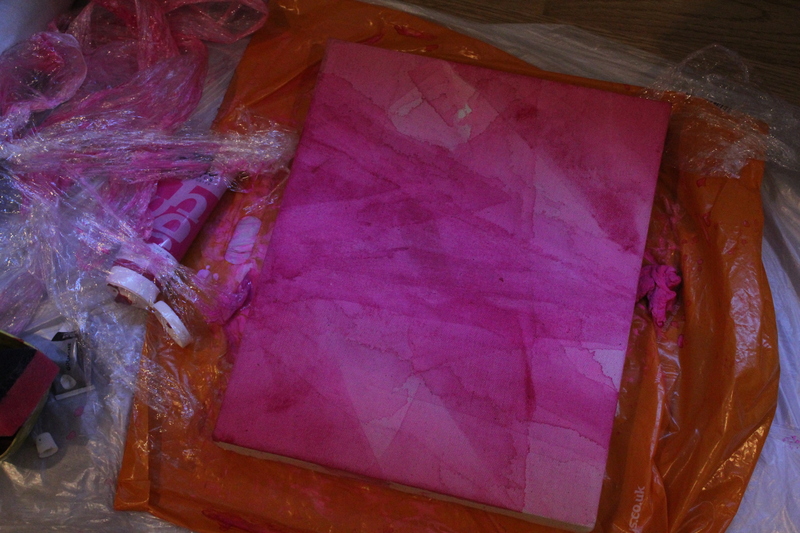 Working for the piece for the Pop Up Pink exhibition has made me realise how much I miss painting. Although I love the direction my work has taken and all the exciting things it’s led to that I thought I would never do (performance being the prime example), I will never give up the paint brush. There is just something so special sitting down with and focusing on a material; building on it, contemplating it, analysing the creation process. When I paint, I can not get enough water. I love loose fluid works, drips, diluted colours, layers. My paintings are very time consuming and are very much a long drawn out process, mostly due to the necessity of drying time. If I get to eager and paint over a layer that’s still wet, my effect is ruined. So patience is key. I tend to paint in stages, dipping in and out of a work. I think this is actually the way I work best in most senses, as when I write an academic piece, I have to let it sit for a few days before I go back and look at it again. I tend to bang it out in one go and then leave it for a week and almost forget about it as the deadline nears! But it’s the same when I work with paint. I like to be fully absorbed by the process, but then I also like to step back and leave it. Really think about what I’m doing and how I’m layering it. Sometimes this really doesn’t work as despite my attempts at contemplating, I still over work the paint. This is the most frustrating moment for me, as my paintings are not the kind where you can just cover up a mistake. Once the mistake is made it’s there to stay as the paint is applied so thinly, it would completely ruin everything if I tried to obscure it. So I think this is why I have started to implement time into a piece more over the years. the older I’ve got, the more I’ve realised you can not hurry or push the creative process. Otherwise you put a pressure on it and it backfires with you creating nothing! With this work I feel I overworked it slightly, but hey I’ll know for next time!